(early) 1978|age 9 “Full reverse Chewie”—and keep on shakin’ it! Solo decides to turn tail and get the hell out of there and then… POW!—the Millennium Falcon is grabbed by the Death Star’s tractor beam. And as always, these very oldest pages keep getting to me. Sentimental old fool that I am. Drawn in that green biro» and featuring the amazing highlighter pen» that my dad brought home from the office stationary cupboard. I was amazed at their fluorescence. And they were just perfect for lasers and spaceship engines. You could do light effects that actually glowed! This made it feel to me, even more like the movie, with its multi-million dollar Special FX. Amazingly, closed away in the dark for 30 odd years—as these pages were—the ink’s retained its luminous green colour perfectly. See the trail of the TIE Fighter that’s entered the Death Star, and the first pass at the Falcon’s cockpit? I wonder where I was when I drew this? Often, I was kneeling on the bedroom floor—the way kids do. I know for a fact that my pal Niall F did that all of the time, and for his homework too. Do you remember doing that? Blissfully unaware of the existence of arthritis but with your feet going numb, you’d think, “I’ll just finish this bit first…” Then on hearing the call for dinner you’d struggle to get up on floppy ankles and stagger and fall about down the hallway towards the kitchen, on what seemed like someone else’s feet. 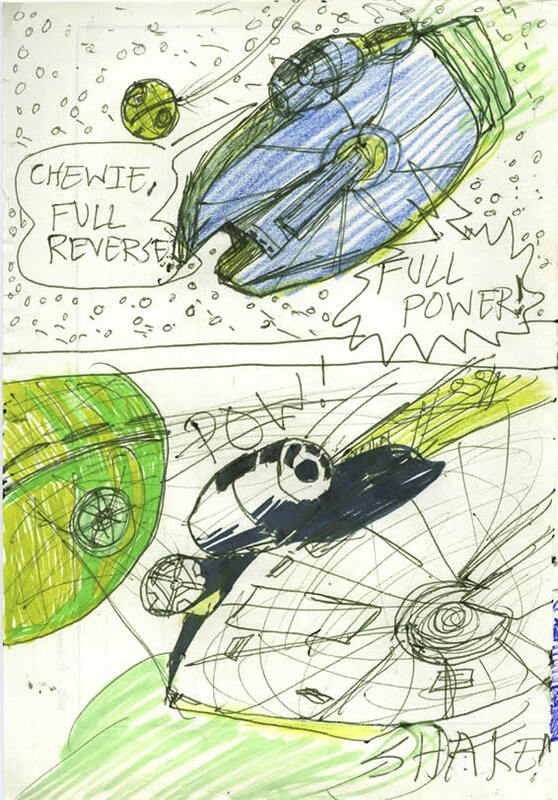 It’s a fact that that the comic was actually begun when propped-up in bed at night and it was probably either that «Tantive IV-hyperspace page or the cover. I think it was always fun to do the cover first, and then maybe carry through and actually do the comic too. Doing a cover was the most fun play-acting you could do. You could pretend that you were on the brink of creating an earth-shattering new publication, for Marvel or IPC or the like. So I busily drew away, by the bedside lamp, excited about my new epic comics venture, until I grew sleepy. Hoping that tonight—I’d dream about Star Wars. I never knew then how many pages it’d grow into, or how many years I’d spend on it. When I did start drawing the first page that night, my dad was away working in Killarney in County Kerry. He’d be gone 5 days a week for many many months, and he says that I cried the first Sunday that he set off for the 5 hour, 150 mile journey on Ireland’s primitive 1978 roads. There wasn’t a single motorway in the whole country back then! No, I’m not joking. He was a management consultant with a firm called MSD near Kill village but hired out to the Liebherr Company in Killarney (hence the brown sticky tape on «the cover). Er, yes. Another stationery cupboard acquisition. Those office cupboards were a veritable cornucopia of creative materials. So exciting. It was MSD’s paper that I worked on, like the one shown here, for most of the early version of the comic. Some was matte uncoated, some was like the one here, which had a slightly shiny, waxy coating that the biro glided over very nicely. Isn’t it amazing the sort of sensation-related detail you can recall after many decades? Do you have any recollections like that? The Millennium Falcon is in the grip of the Death Star's Tractor Beam! "Chewie—full reverse!" shouts Han Solo. "FULL POWER!" The Falcon has spun around, its rear towards the Death Star. POW! SHAKE!